The Amen Solution is a brain-based diet that can help you to lose weight as well as improve your mood and enhance your memory. It was created by Dr. Daniel Amen, bestselling author and brain expert, who offers the same program to patients at his Amen Clinics, where he has helped thousands of people to achieved their weight loss and health goals. Amen says his ten-week program offers a different approach to losing weight that uses your brain, in contrast to traditional methods of dieting that are generally not very effective. He explains that many weight problems actually begin in the brain instead of the stomach. The Amen Solution includes practical strategies to help you understand the way your mind works so that you can lose weight forever. Initially you will identify your brain type from a selection of five different brain patterns. This is an essential factor for lasting weight loss because not everyone needs to take the same approach. When you understand how your brain works you will gain a greater knowledge of what drives your eating behaviors, which gives you a better chance of achieving your weight loss goals. Following the food and eating style that works best for you will allow you to improve your concentration, memory and mood, while at the same time assisting you to lose weight. You will learn the keys to overcoming cravings and emotional eating and how to maintain a high level of motivation. Dr. Amen provides dieters with “Seven Rules for Brain Healthy Eating”. Food journaling is also an important part of the program and can increase the awareness of what you are putting into your body. Nutritional supplements are recommended because they can enhance weight control, mood, focus and memory. Certain supplements are advised for almost everyone and others are explored for their potential use for specific health issues. The Amen Solution includes a selection of brain healthy recipes and menu suggestions for better choices in fast food restaurants. There are also lists of the Fifty Best Brain Healthy Foods, Good Mood Foods and Get Smart Foods. Blueberries, banana, spinach, tomato, asparagus, sweet potato, eggs, low fat yogurt, salmon, turkey, skinless chicken, lean meat, quinoa, whole wheat pasta, walnuts, almond butter, avocado, black beans, rice protein, coconut oil, olive oil, cinnamon, garlic, thyme, dark chocolate, green tea. Dr. Amen says that it is necessary to do both physical and mental exercises for weight loss and a healthy brain. He explains the right kind of exercise you should do to boost your metabolism, as well as how learning new things can improve the function of your brain. Suggested activities include strength-training, aerobics including burst training and exercises to improve coordination. The Amen Solution includes a reference chart of the number of calories burned with different exercises. 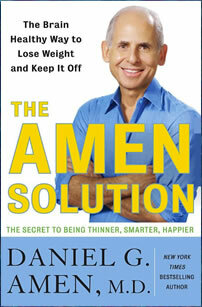 The Amen Solution: The Brain Healthy Way to Lose Weight and Keep It Off retails at $25.99. Includes unique information related to improving the health of the brain. May assist with the management of depression. Encourages a regular exercise regime. Addresses the importance of correct focus and stress management for effective weight loss. Provides a selection of brain healthy recipes. The Amen Diet can be customized to suit different personality types. Dr. Amen is a medical doctor who has successfully used this program with his patients. Some readers may find parts of the Amen Solution to be overly scientific. Recommends nutritional supplements, which may increase the expense of following the program. Will probably require more time for preparing food and meal planning. The Amen Solution Diet doesn’t contain a structured meal plan. The Amen Solution is a brain based diet program that is focused on understanding how the mind works and is involved in certain eating behaviors, as well as improving brain health in order to bring about lasting weight loss. This program will appeal to dieters who would like to learn more about the brain and the role of nutrition and other lifestyle factors in promoting optimal brain function.